Jacqueline Bouvier Kennedy Onassis, 1929–1994. First Lady of the United States, 1961–1963. 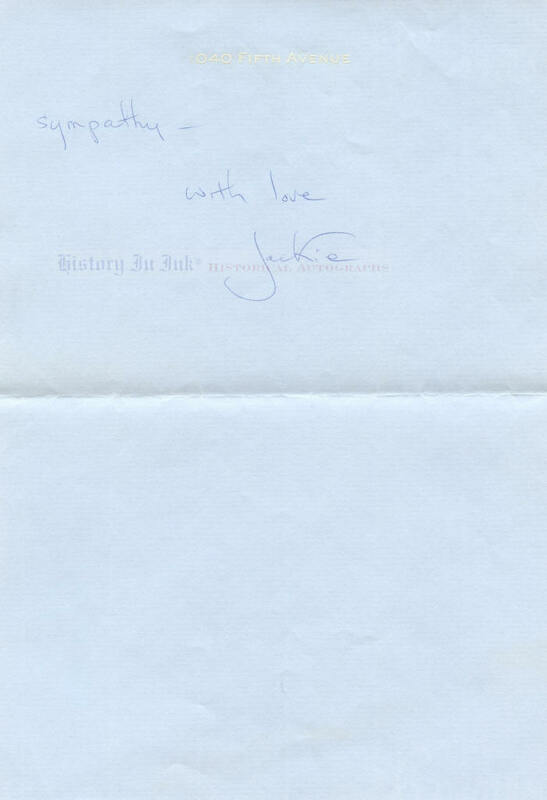 Autograph Letter Signed, Jackie, two pages, 5¼” x 7½”, on personal engraved stationery of 1040 Fifth Avenue, [New York, New York], February 9, 1972. With original envelope in her hand with second signature, Onassis. Jacqueline Kennedy, one of America’s most respected and beloved First Ladies, knew well the pain of losing a husband. She was beside President Kennedy in the back seat of his open limousine when he was assassinated in Dallas, Texas, on November 22, 1963. Her poise and grace during the emotional hours and days that followed endeared her even more to generations of Americans then and since. She remarried Greek shipping magnate Aristotle Onassis in 1968 and became a widow a second time when he died in 1975. Llewellyn E. “Tommy” Thompson (1904–1972) was a career American diplomat who served at a critical time in history as the United States Ambassador to the Soviet Union under Presidents Dwight D. Eisenhower, Kennedy, and Lyndon B. Johnson. Thompson joined the Foreign Service in 1928, and during his long and distinguished career he served as the United States Ambassador to Austria from 1955 to 1957. Eisenhower appointed him Ambassador to the Soviet Union in 1957, and Kennedy reappointed him in 1961. He resigned in 1962, but Johnson reappointed him in 1967, and he served until 1969. He also held the posts of Career Ambassador and Ambassador At Large. He was part of the Executive Committee to the National Security Council, or ExComm, which advised Kennedy during the Cuban Missile Crisis in October 1962, and he was present at Johnson’s summit with Soviet Premier Alexei Kosygin at Glassboro, New Jersey, in June 1967.  Mrs. Kennedy has written and signed this letter and addressed the envelope with blue ballpoint pen in her distinctive hand. The letter is in very fine condition, with one horizontal mailing fold, which barely affects a few words of text on the first page. 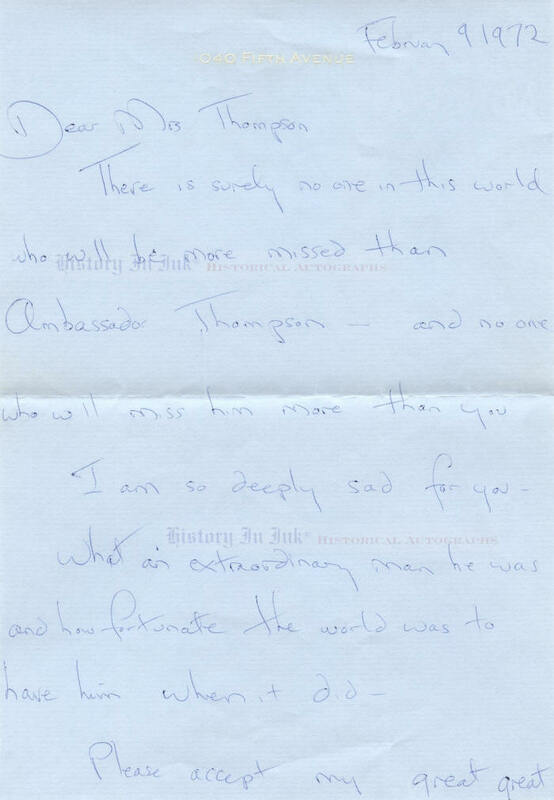 The original envelope bears a second signature, Onassis, with a handwritten return address on the back, and Mrs. Kennedy has addressed it by hand on the front. It has been opened carefully at the top. It bears postal markings, which affect the words “New York City” in her hand on the back, and a pencil notation in another hand in a blank area on the front. The envelope is in fine condition. � History In Ink, L.L.C.